Ramsey was remembered by George Washington, who would later appoint him to powerful law enforcement positions in his home State of Maryland. Nathaniel Ramsey had some very creative siblings. Though he was born and raised in Pennsylvania, Nathaniel Ramsey attended law school at the College of New Jersey (now known as Princeton) before settling in Maryland. As the hostilities between colonists and the Mother Country grew, Ramsey was elected to attend the Annapolis Convention. Not to be confused by the later Convention of the same name which led to the Constitution, this first convention was Maryland’s Revolutionary Government. During this time, Nathaniel assisted in driving his adopted home toward independence. The following year, Ramsey joined William Smallwood’s Maryland Brigade as a Captain and went to New York where he survived the disastrous Battle of Brooklyn. By the end of 1776, Nathaniel Ramsey had been appointed Lieutenant Colonel of his own regiment. His first task was to participate in the defense of Philadelphia from the British Invasion. Ramsey had an important role in the Battle of Monmouth. At one point, the British retreated, regathered themselves, and returned to the field. General Washington ordered Nathaniel to lead his men in a charge with the intention of buying some time to reorganize for the next round of fighting. Ramsey did this, but in doing so lost many of his soldiers, as well as receiving a serious bullet wound. Ramsey’s injuries were so great that the Continental Army left him in the field, assuming he would die. He survived the shooting but was taken captive and spent almost a year as a British prisoner. After his release, his men had already moved to the Southern Department of the Revolutionary War. Still yet to regain his full health, and uncomfortable making the lengthy trip alone, Nathaniel resigned his commission and returned home. Although he focused on his private law practice, Ramsey never ceased working in the public sphere. In the mid 1780’s, Nathaniel even spent two years representing his State in the Confederation Congress. After the ratification of the Constitution, Washington appointed Ramsey as the original U.S. Martial for the Maryland District. Additionally, Nathaniel was chosen as Port Captain for Baltimore. With these two positions, Nathaniel Ramsey spent Washington’s Administration as the highest ranking lawman in Maryland. Do you want to learn about other Founders who survived wounds sustained while fighting the British? Want to read more about the Battle of Monmouth? This was one of the most important turning points of the Revolutionary War. 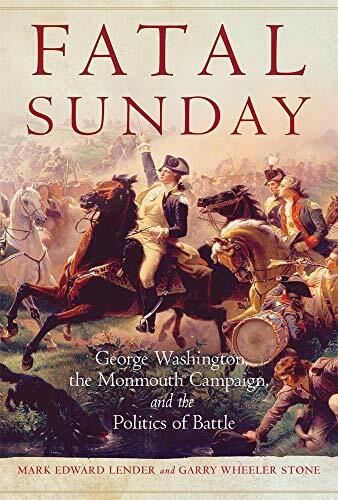 ‘Fatal Sunday’ makes one of the most complicated engagements of the Revolution palatable and easy to understand. Pick up a copy through the Amazon affiliate link below (you’ll support this site, but don’t worry, Amazon pays me while your price stays the same).